There is something intensely hypnotic about dramatic deep shades, an allure that reminds us of the veil of midnight, or the vastness of the cosmos. With darkness comes stillness and quietude, and the deepest realms of serenity may capture us. The hues of night do not have to remind of of shadow, but instead of the comfort and wonder of the dream world. 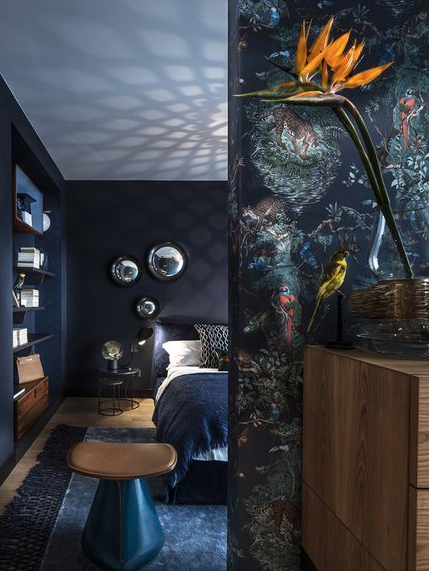 Walk with us through the dreamy depths of dark pigments in these modern homes! Feeling inspired? Visit these Modern Industrial Lofts to gain insight for transforming your space into an extraordinary vision!